Interested in celebrating Carnival with your cousin in Argentina, or not sure when your friend in Zurich is off for the Swiss National Day holiday? 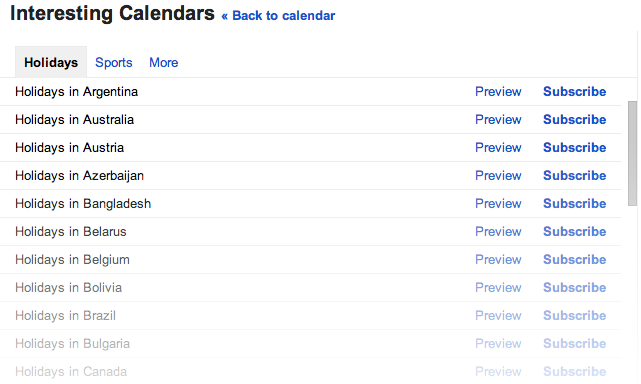 You can now choose from 30 additional country holiday calendars in Google Calendar to help keep track of special occasions in different countries so there’ll be even more to celebrate. The calendars, which will be rolled out over the next few days, also contain a wider variety of holidays and display dates for holidays further into the future, so you can have enough time to book a flight to Buenos Aires to join your cousin for the water games, or ask your friend to send you a dozen August-Weggen.